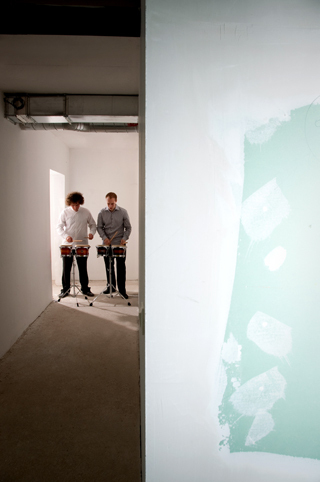 Drumartica is one of the most active percussion ensembles in Europe today. After a great success at the prestigious competitions in Luxembourg (IPCL) and Bulgaria (PENDIM) the duo has played in the USA, Russia and around Europe in important halls such as Hermitage Theater in St. Petersburg, Carnegie Hall in New York, Auditorio de Tenerife and Berlin Philharmonie. Simon Klavžar and Jože Bogolin studied at the Munich Music University with the percussion legend prof. Dr. Peter Sadlo, one of the best percussionists in the world today, and in Frankfurt with the members of Ensemble Modern. What at first looked like playing for fun from the beginning in 2006 turned out to be a longtime relationship which immediately gained international success. Already as students did the members astonish their listeners with great solo recitals and concerts with orchestras – Slovenian Philharmonics, SNG Opera and Balet, Academy of Music Orchestra. Since 2006, the duo played in the USA, Spain, Russia, Luxembourg, Italy, Germany, Austria, Switzerland, Serbia, Bosnia and Herzegovina and everywhere around Slovenia. Audiences around Europe come to Drumartica concerts for relaxed atmosphere, music that suits every ear and powerful yet sensitive performance. Drumartica is a winner of University Prešeren prize as well as Academy of music Prešeren prize. The duo was awarded second and audience prize – as well as being absolute winner – at the prestigious Percussion Competition in Luxembourg (IPCL 2009) and won the first prize at the percussion competition PENDIM in Bulgaria the same year, still as bachelor students. The Duo was awarded the third prize at the Salieri-Zinetti Chamber Music Competition 2011, first prize in the same competition in 2012, audience prize at the Almere Chamber Music Competition and the audience prize at the Carnegie Hall Musical Olympus Festival. The members of the duo were first and second prize winners in the Slovenian national music competition TEMSIG in years 2002, 2005 and 2008. Since 2010, Drumartica organizes a percussion festival XYLODRUM in Ljubljana, Slovenia. The duo members are very active as educators, giving seminars or workshops. An important part of their activity is to commission and perform new music as well as joining different ensembles and orchestras. The duo is not only a concert hall ensemble. They play in many different venues and settings like alternative music venue Metelkova Street in Ljubljana or even more alternative Čadrg Records festival. They played in many different settings such as with a popular band Melodrom in an original mixture of rock band and percussion duo and as soloists with Wind Orchestra. Drumartica cooperates with Mini Musik children's concerts cycle in Munich and with new music festival Slowind in Ljubljana, Slovenia. Drumartica endorses percussion instruments Adams from the Netherlands and Innovative Percussion sticks and mallets from the USA.